Astroprint is a San Diego based company with the vision to take 3D printing to the next level. The company started with the AstroBox, which was a device that could be connected to any 3D desktop printer to give it access to a cloud network. This cloud opened up many possibilities for 3D printing. That’s exactly what Astroprint is all about. It aims to expand and maintain a cloud to allow more 3D printing options. Astrobox has succeed and recently it’s been working on a newer version: Astrobox Touch. AstroBox Touch can be plugged into a 3D printer while simultaneously being connected to the internet wirelessly. This means that you can control your 3D printer remotely using your touch screen, which separates it from the old AstroBox. The new AstroBox Touch has a 3.5 inch screen and can connect your 3D printer to mobile apps, desktop software, and the internet making 3D printing accessible almost anywhere. The device is compatible with 3D printers running Repetier, Marlin, and Sailfish firmware and is powered by Raspberry Pi. You don’t need to worry about the assembly and configuration of the AstroBox Touch as it barely requires any. All you need to do is set it up in a few simple steps and you’re connected. If you go for the optional webcam you can even watch as your designs are printed. You can also access your print history using the device. 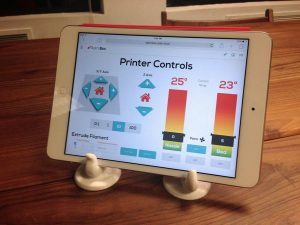 Besides the AstroBox Touch, Astroprint is also releasing mobile apps that will enable you to control your 3D printer remotely. Astroprint is becoming “the Android of 3D printing” as they aren’t just releasing apps but will soon allow developers to create their own apps to add more options to the AstroBox Touch. Astroprint is becoming the go to platform for 3D printing. Their leading the pack with effortless hardware and software compatibility. Cloud storage and being able to download directly from your phone or an app are the future of 3D printing. Cables and wires are old news. Astroprint is taking steps in the right direction, in the direction of the future. Astroprint is making 3D printing even more convenient than 2D printing. Having a cloud for your designs that can be shared and sent directly to your 3D printer is revolutionary. It’s even more impressive that there’s no limit to what can be achieved using this device thanks to the apps that will be created. Astroprint is a relatively new company but it’s certainly bursting onto the 3D printing scene and potentially changing it forever. FlatPyramid is one of the to order custom oldest 3D modeling marketplaces.